CHICAGO – The jersey will be hung up right next to another one that looks just like it inside Marian Hossa's home. This one will be for the Stanley Cup, while the one that's already on his wall commemorates a Memorial Cup victory in juniors with the Portland Winterhawks, whose jerseys are almost identical to the Blackhawks'. "As we got further and further (in the Playoffs), it felt like this was just meant to be," Hossa said of winning the Stanley Cup. "Going into Game 6, we were wearing white, and that's what we wore when we won (the Memorial Cup), in the white. I said, ‘This must be it.' Then it happened and what a great feeling." Hossa didn't downplay the importance of this Cup win, after playing for it the previous two seasons and losing both times. "To tell you the truth, this is the best moment in my hockey career," he said this past Saturday on locker clean out day at the United Center. "I still don't think it has hit me yet. I think I'm going to need a few days. I think when I come home, that's when I'm going to really realize … what we've done here." Hossa also revealed that he sprained the MCL in his right knee in Game 1 of the Cup Final against Philadelphia, but kept playing with two braces for support. "That was kind of difficult, but you know what? This makes it feel better," he said of the ongoing celebration. "You don't feel the pain as much as if you lose. That makes it even more painful." Keith anxiously awaiting new teeth -- Even Duncan Keith had to laugh at the first few batches of jokes about his seven missing teeth in the front of his mouth – which were knocked out in Game 4 against San Jose. Now, he'd like to get his smile back with the help of a team dentist. "It seems like it's taken on a life of its own," Keith said. "All anybody wants to do is make me smile and then laugh at me, but I guess it's kind of funny that way and one of the stories of the playoffs. But I'm definitely looking forward to getting some nice teeth." He's also been getting business cards from dentists. "I had a couple actually last night come up to me and give me their cards, but I'm taken care of," he said. He's hoping to have his new grill, or at least part of it, in place in time for Friday's 2010 NHL Awards in Las Vegas. Keith is a finalist to win the Norris Trophy and plans to bring a group of family and friends. A long trip, but worth it -- The Hawks are busy making the rounds in Chicago with their silver prize in tow. On Monday, several of them will tote the Cup to Burbank, Calif., for a taping of "The Tonight Show with Jay Leno." Jonathan Toews, Patrick Kane, Brent Seabrook and Duncan Keith will head West with the Cup this time instead of their Olympic medals – which they showed off on the show in March when appearing with the entire Hawks team. "It'll be nice to go to the Leno Show again," Keith said. "It's a long way to go, to go there for one night, but it's just a pleasure to be on that show and bring the Cup there." Seabrook said he's mostly enjoyed just being with his teammates for all the Hawks hoopla. "It's a great group of guys and we have fun being together," he said. "That's what I'm looking forward to. All that stuff -- Jay Leno and Sportscenter and going out to LA and going to the White House -- is great. It's a great honor to do those things, but I think the best part about doing it is being with your teammates and being with this group." Big Buff has raised expectations again -- When you score 11 goals in the playoffs and help lead your team to the most coveted prize in hockey, the bar is going to be raised for the next season. Hulking 6-foot-4, 257-pound power forward Dustin Byfuglien knows the feeling. He was saddled with bright expectations after a good playoff run last season, but failed to live up to the billing during this past regular season. After a huge playoff effort in 2010, Byfuglien is squarely in the spotlight again. Hawks coach Joel Quenneville sees massive potential if Byfuglien commits to playing in front of the net. "That's the one thing he should be pushing himself to achieve is that consistency, because he could really be a dominant guy in the League," Quenneville said. "We saw how dominating he can be. I don't think there are too many games where one player dominated like he (did) in Game 5 (against Philly)." Seabrook forgives and forgets -- It was one of the nastier hits doled out this past season, and Brent Seabrook was on the receiving end during a March 18 game at Anaheim. Former Hawks teammate James Wisniewski blindsided Seabrook after charging at him from just past the left circle. Seabrook got a concussion that caused him to miss two games. It was a retaliatory hit for a legal hit that Seabrook put on Ducks forward Corey Perry. Initially, Seabrook had harsh words for Wisniewski – who'd invited him to his wedding this summer. On Saturday, Seabrook said they talked things over just before the playoffs. "I understand the game happens quick and things happen fast, and you make a split second judgment and things can happen that quick," Seabrook said. "I don't think Wiz was trying to hurt me, but at the same time it was a bad hit and there's no room in the game for that. I think that he understands that and he admitted he made a mistake." As for repairing the friendship, the conversation was enough to mend it. 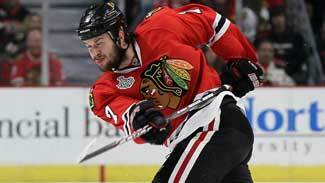 "We talked it out and laughed a little bit and things were fine after that," Seabrook said. "It was a good conversation and we still talk. He texted me about winning the Cup and we were texting back and forth, so that part's over." Sharp relishes ongoing celebration -- One of the Hawks' most recognizable faces, despite his newly shaved look, is Patrick Sharp's. The team's co-leader in playoff goals during the Cup run has been busy parading the Cup from place to place in Chicago. "I've got about six hours (sleep) in the last three days, but that's what it's all about, going out and having fun with everybody," he said. "To see the fans lift (the Cup), to see our family members raise it over their heads, that's what it's all about." He described a typical Cup viewing during a night on the town. "As soon as that silver Cup comes in the room, it's just the best thing ever," Sharp said. "Everyone flocks to it. That's probably the (best) memory I'll have -- just seeing everyone's faces light up when that thing comes in. (We) saw Vince Vaughn and Kevin James last night, and they were having fun with the Cup. It's been a lot of fun." "I just hope they spell my name wrong when they put it on the Cup … sorry, spell it right." Next season already looming -- Sharp has friends in the League from his hometown of Thunder Bay, Ont., who are already several weeks into their off-season training. Regardless, he's not going to let that make him feel behind. "That's what you train for, to get to the Stanley Cup Final," Sharp said. "Other teams have done it. I'm sure training camp will be a little different next year, but I wouldn't trade it for anything." Madden likes Sharp at center -- One of the more unheralded moves by Hawks coach Joel Quenneville was moving Sharp from the wing to centering the second line. The move was made for the playoffs and worked like a charm, with Sharp ending up as the team's co-leader in post-season goals with 11. Sharp likes playing the wing a little better, but veteran fourth-line center John Madden thinks he should stay put in the middle. "When Joel moved Sharpie to center, I thought it was a great idea," Madden said. "I think Sharpie's a better center man than he is a winger. Obviously, you've got to work a lot harder at center, but he did a great job and I think he looks better there." Coach Q is one happy camper -- Not even his house being "toilet papered" after the Hawks won the Cup last week in Philadelphia was enough to erase Quenneville's smile. He's been grinning from ear to ear since winning his first Cup as a coach (he had won one as an assistant with Colorado). Friday's ticker tape parade and rally -- which drew an estimated 2 million people -- is one of the biggest reasons. "That was an amazing, amazing display," he said a day later. "Probably the coolest thing I've ever seen. And being a part of that was truly special, just standing up there and looking out at the people in the streets and in the windows and on top of buildings. That was spectacular." So spectacular that he's willing to overlook the TP job on his house, which was shown in a photo on TMZ.com. 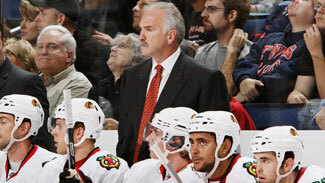 "It's all in good fun and received in good fun," Quenneville said. "I was not disappointed one bit, but I don't know the characters (who did it) and payback is something I'm not concerned about." "My legs and my back are sore," he said. "Seems like we continue to keep picking paper up. Hopefully it'll be done (soon). It's an ongoing mess." Kane happy to get his gear back -- Nobody on the Hawks seems to know where the puck from the game-winning goal in Game 6 wound up, and they don't seem to care. Patrick Kane, who scored the goal, said he'd like to have it as a keepsake – but is also just happy to get all the gear back that he threw onto the ice. "I'm actually surprised they scooped up everything … my gloves, my stick and my helmet and mouth piece," Kane said. "I remember throwing that, but I'm surprised they found everything." Kane moving on from off-ice issues -- During Friday's rally, Kane poked fun at himself for two well-publicized off-ice incidents in the past year. He and his cousin were arrested last summer for an altercation with a cab driver over a small unpaid cab fare. Then Kane and other Hawks players were shown in some embarrassing online photos partying shirtless in a limousine with some women in Vancouver. Kane said his way of moving past those incidents is just to joke about them now. "You look back on it and have fun with it," he said. "The issue is over. It's gone and done with. It's something that I'll probably have to live with for the rest of my life, obviously, but for me, I can just have fun with it now that it's over and just try to blow it off, I guess." "I just hope they spell my name wrong when they put it on the Cup … sorry, spell it right." – Patrick Sharp. "They made me change. You should see what I was just wearing." – Duncan Keith, after somebody said he looked like a truck driver.